In 2017, Suzanne Stevens had an idea. As CAPS National President, she thought there was a need to serve the CAPS and non-CAPS communities by advancing a conversation around healthy minds and wellbeing. A number of Chapters offered events and there was plenty of uptakes. One example was a conversation between David Gouthro and Barry Lewis Green, both with experience in offering events around this idea. It started with questions. What if we offered a national online conversation focusing on healthy minds and wellbeing? What if we focused on interviewing professional speakers; entrepreneurs who engage audiences around the world on topics broad and deep? What if we asked them about who they were, what they do, for whom they do it best, what challenges do they face in doing that, and how do they best take care of themselves while doing it? What would that look like? Well, in late 2018, they found out. They tried it. And it is gaining traction. Seven episodes later, Healthy Minds and Well Being has been interviewing those entrepreneurial speakers, trainers, facilitators and coaches. 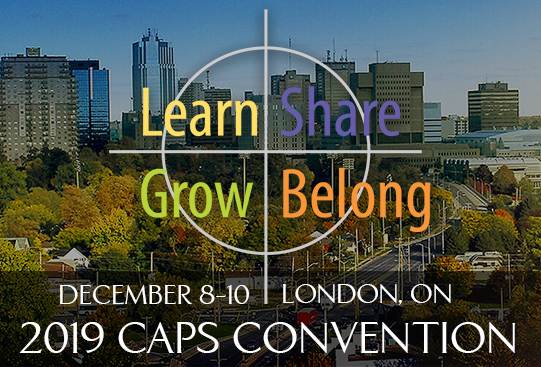 It is engaging contributors from across Canada in genuine, open and honest conversations about the challenges facing them and the practical techniques they have developed to handle them. Though they are live events, the conversations are recorded. The CAPS Foundation has generously committed to inventorying the recorded videos; there is also an online Facebook community called “Thinking CAPS” where the videos can be viewed. The conversations are run monthly, engaging great people in great conversations around healthy minds and wellbeing . . . while having some fun in the process! At Healthy Minds and Well Being, our mission is simply to move the needle on talking about how we take care of ourselves as speakers and entrepreneurs around Canada and the globe. These enriching and informative conversations take place monthly on a Sunday evening from 7:00 pm to no later than 8:00 pm EST via Zoom. This is one labour of love and we would love to have you join us. And, we thank Suzanne for starting the fire.